This place wasn’t open when I last posted. It’s been a while. Work (you know, for money), coughing and spluttering and the rest of real life took over, as it does. Anyway, I was driving down Dame Street thinking that I needed to find an eatforafiver spot or I’d run the risk of losing my massive audience (all seven of you), when I saw this place. It’s situated beside that ornate AIB building opposite the Olympia Theatre. I parked and walked up Dame Lane (I love Dame Lane). There’s a chipper (the name of which escapes me) between Dame Lane and Dame Street which briefly distracted me with its loose talk of Cod Gujons for a fiver, but I struggled manfully on. 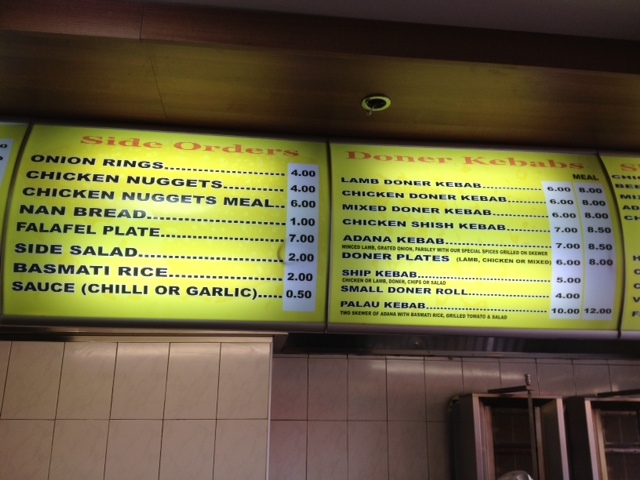 So … Mangal Kebabs. Lovely bright sign. 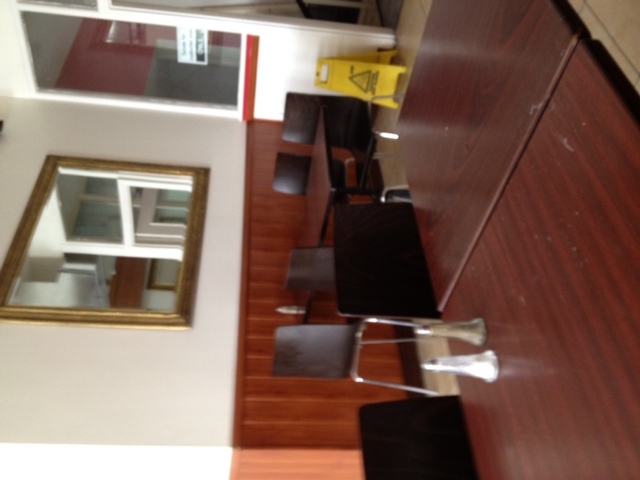 Clean looking serving area with two blokes behind it. They don’t have a printed menu or a leaflet (yet, they said) but there was a good selection of food advertised over the counter, as you can see (click on the pics to enlarge), with several items for a fiver or less. I chose the rather interestingly named Ship Kebab (which I think should read ‘Chip Kebab’), paid over my fiver and found a seat. This wasn’t difficult. The restaurant seats at least 44 people, and more if people squeeze together on a long banquette. There were three other customers when I sat down. A tourist family of four arrived sometime later. 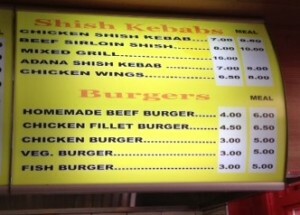 With a bit of effort, the owners could make something of this place and draw in a bit of a crowd with prices like this. Dame Street is busy with pedestrians and it’s full of reasonably-priced eateries. While that means more competition, it also means that people looking for somewhere to eat in South Dublin who don’t want to shell out great wads of cash will gravitate there. 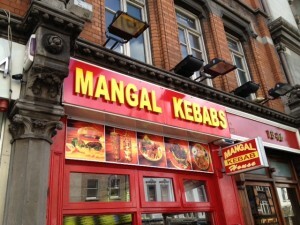 Mangal is scruffy. The walls are painted white. 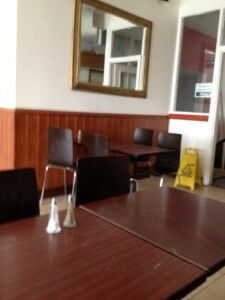 The tables and chairs are brown and cheap-looking. 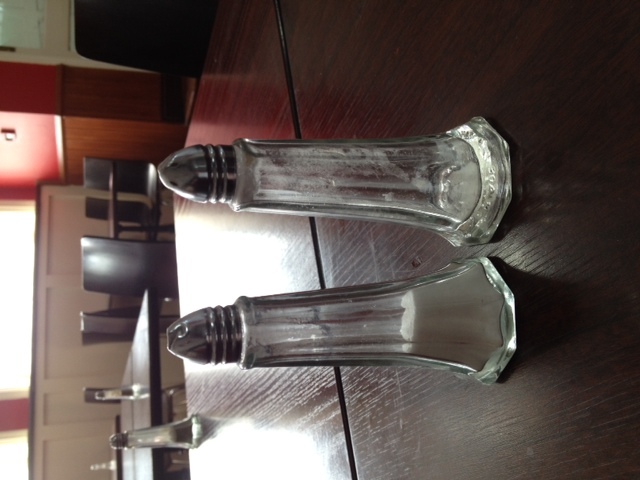 Cruet sets (unnecessary in a place like this) are nasty looking and several were empty in any case. It would also help if every so often one of the blokes behind the counter would grab a damp cloth and give the tables a wipe. And the music is rubbish. A bit of a middle-eastern colour theme with maybe some music like this might help create an appropriate and comfortable atmosphere. A decent plateful. 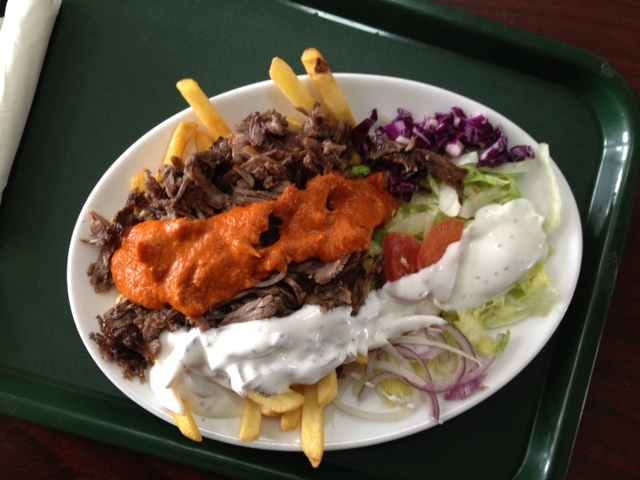 A bed of chips on top of which sat a pretty good helping of lamb Shawarma, beside which was some shredded red cabbage, iceberg lettuce and a couple of quarters of a tomato. 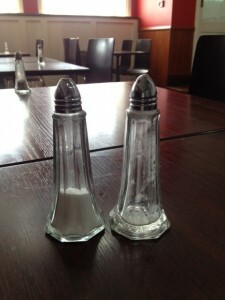 Two sauces had been applied, more of which later. The lamb was very tasty. I love lamb shawarma anyway, with its gentle spices, tenderness, rich flavour and caramelised crispy bits (my favourite Shawarma place is Iskanders, down the road from Mangal). 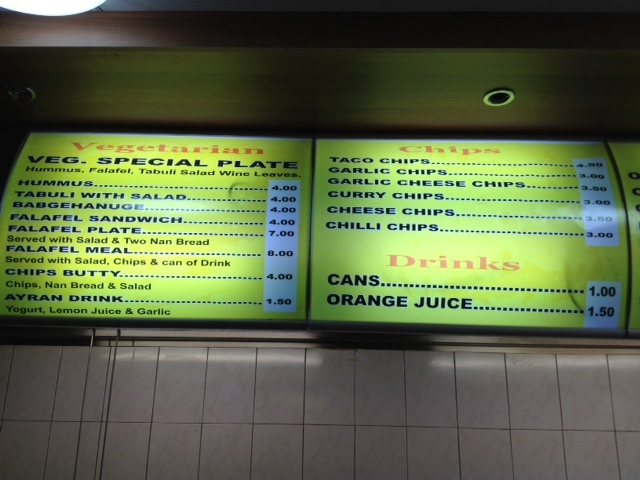 The salad was crisp and fresh, and the chips were … well … chippy. The sauces let the dish down a bit. Over the salad was spread a sweetish garlicky mayonnaise-type sauce. Something a little less sweet and a little more yoghurty might have been better. The orange stuff they spread on the lamb was awful. It tasted vaguely tomato-y but had an unpleasant aftertaste. 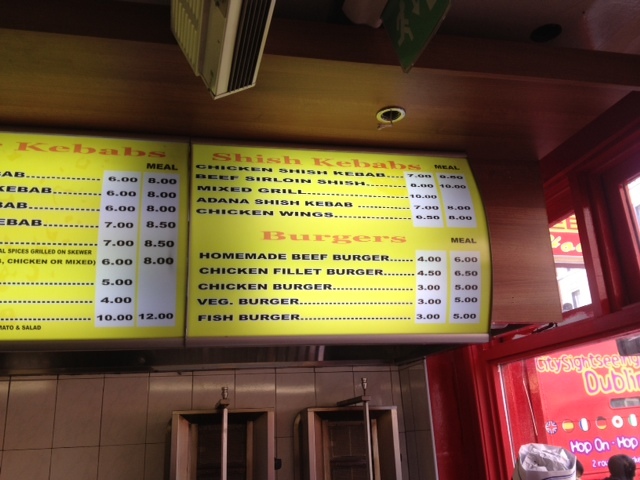 The menu display refers to a Chili Sauce but there was no discernible chili taste from this gloop. Still, overall, this was pretty good value for a fiver. It was (the sauces excepted) tasty and filling and (again, sauces aside) I’d say keep Mangal in mind if you’re gripped by a longing for a kebab and you’re a bit short of cash.